Nantucket’s sandplain grasslands are upland plant communities unique to this region of North America. Once common along the northeastern seaboard, residential, and commercial development and succession to shrublands has all but eliminated these habitats from other coastal areas from Long Island, New York to coastal Maine. 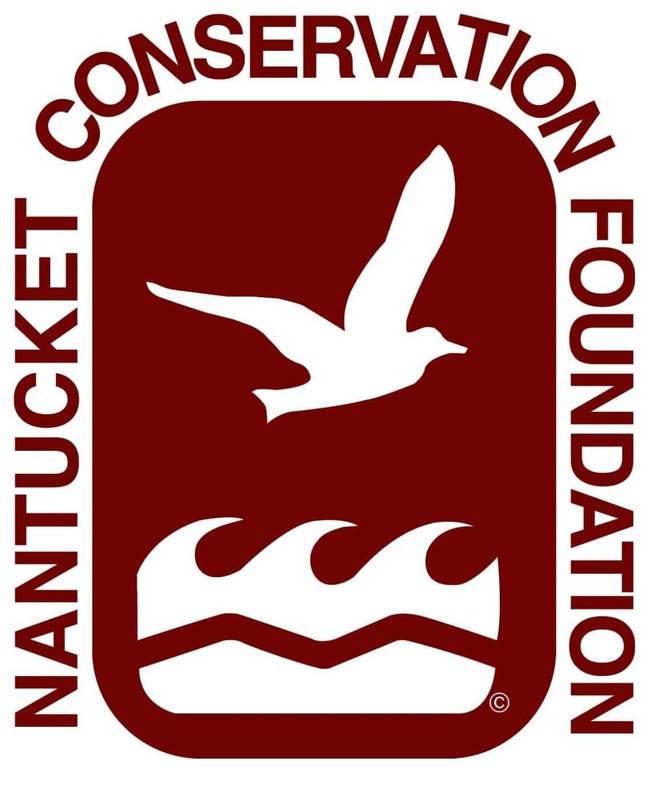 It is currently estimated that between 85-98% of the worldwide acreage of these habitats have been lost since the 1850’s, with the vast majority of remaining sites occurring on Nantucket, Tuckernuck, and Martha’s Vineyard. These iconic hot spots for biodiversity are important conservation priorities because of their relative rarity, limited geographical range, and the diversity of uncommon plant and animal species they support. Sandplain grasslands are relatively flat, open habitats similar to the prairies found in the Midwest. They are generally found on the southern shoreline of Nantucket, geologically known as the outwash plain, where fine sand and debris were deposited by glacial meltwaters. Because of their coastal location, they are also threatened by sea level rise, erosion and other impacts associated with climate change. As the name implies, they are dominated by grasses interspersed with patches of low growing shrubs and annual and perennial wildflowers including a predominance of aster and goldenrod species. Several members of the Foundation’s science staff serve on the steering committee of the Sandplain Grassland Network, a regional partnership among researchers and managers that formed in 2016 to advance understanding and effectiveness of the management of sandplain grasslands. 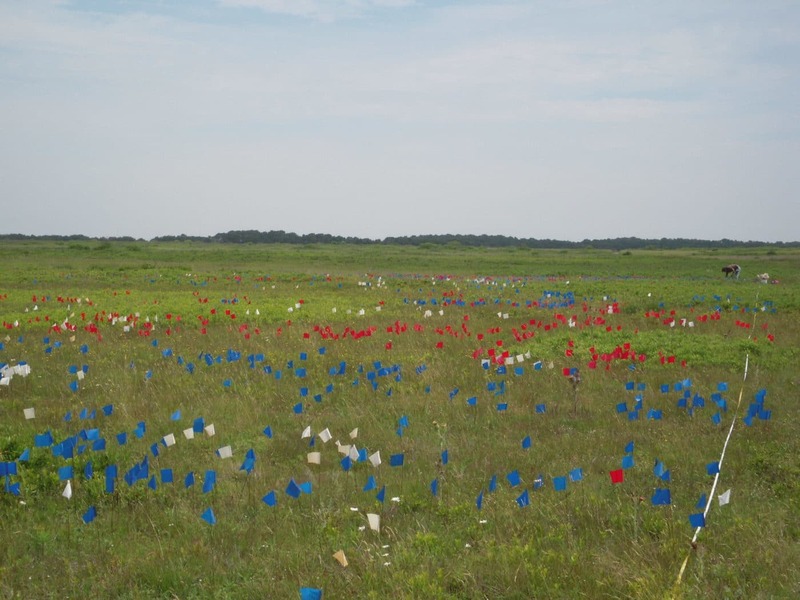 The Network shares methods and understanding gained from experiences with managing grasslands across the region to better protect and foster the unique and rare species that sandplain grasslands support. 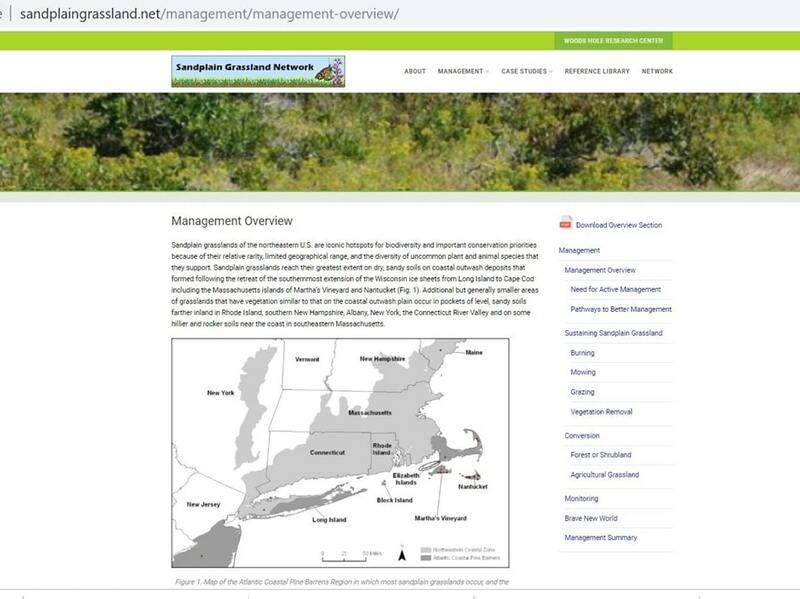 After several years of collaborative work, the Network just released a new web-based report (http://sandplaingrassland.net/) that describes sandplain grassland management successes, lessons learned from past actions and recommendations for improving management going forward. The report contains information from published literature, scientific reports and from interviews with more than 30 researchers and managers who have many decades of hands-on experiences managing sandplain grasslands across the habitat range. One of the key findings from the report is that renewed efforts are needed to manage the encroachment of woody vegetation that has been steadily increasing in many sandplain grasslands across the region despite ongoing management efforts. More effective management will require increased use of established management techniques such as mowing and prescribed fire, experimentation with more “outside the box” techniques such as livestock grazing and disk harrowing, and implementation of combinations of techniques that maximize ecological benefits and can be implemented on a predicable basis. The report also urges greater use of these techniques during the growing season, as past research has demonstrated that this is the time of year when efforts to reduce woody shrub cover will be most effective. The report contains case histories that describe the success and challenges of management of grasslands in specific places across the region. In particular, the Foundation’s Squam Farm sheep grazing research and Serengeti disk harrowing and native seed addition project are highlighted. Also included are recommendations for improving monitoring of vegetation and wildlife that inhabit these areas to better document how these species respond to management. A reference library of publications and reports that describe previous management actions and experiments is included, many of which have not been generally available until now. 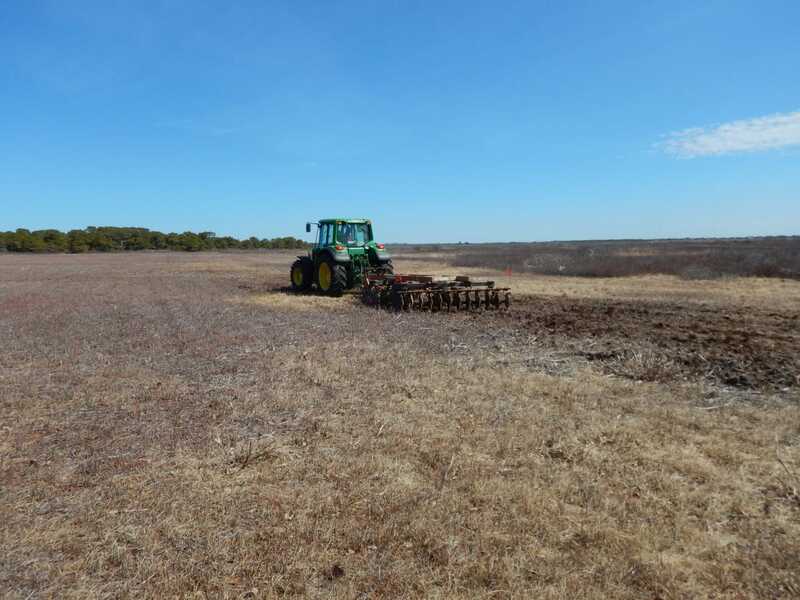 New challenges that will arise in managing sandplain grasslands and their biodiversity in the future in the face of climate change, sea level rise and increasing pressures from more intensive human use of adjacent coastal lands are also described. Sandplain Grassland Network Participants and affiliations. As one of the largest conservation landowners of this rare habitat across its range, the Foundation is an important stakeholder and key participant in this collaboration. 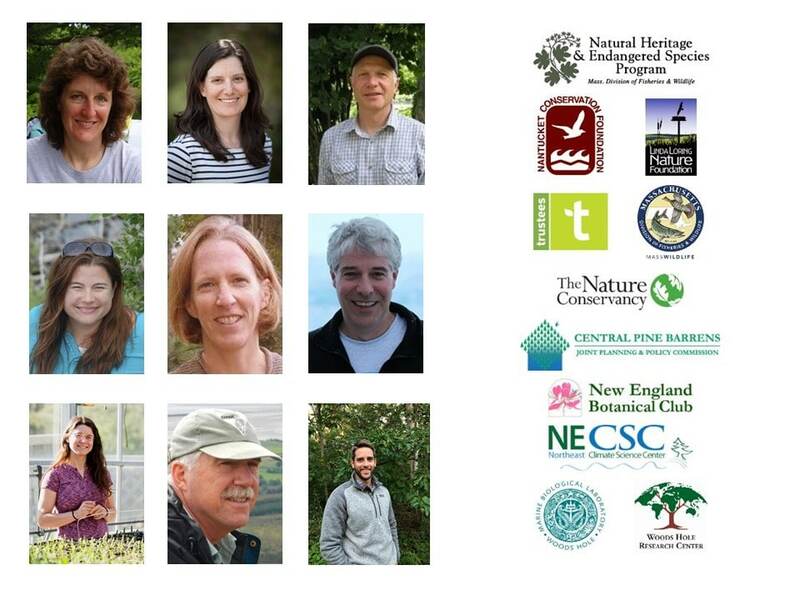 We look forward to continued work with our partners, which will include publication of a summary of the just-completed web-based report, participation in collaborative management and research projects and opportunities to visits other grassland sites and learn from their management successes and challenges. 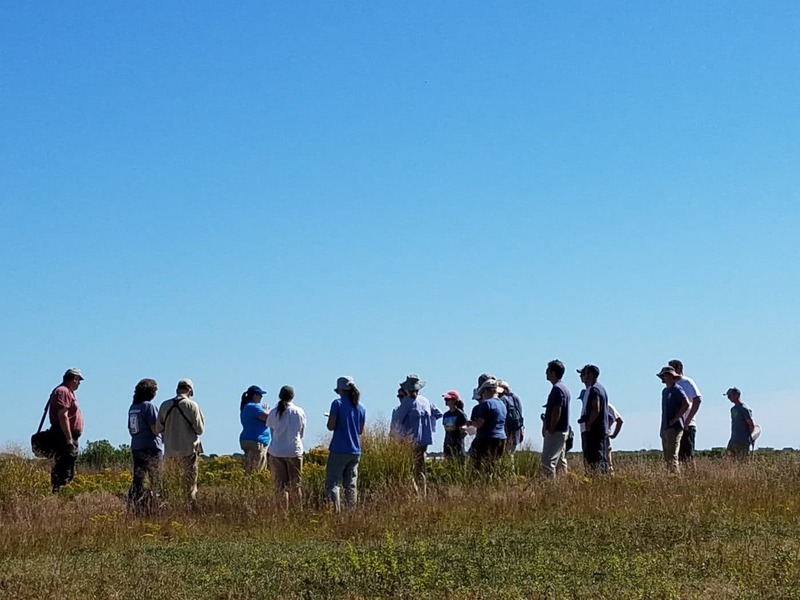 The Sandplain Grassland Network consists of representatives from Nantucket Conservation Foundation, Linda Loring Nature Foundation, Central Pine Barrens Coalition, the Massachusetts Natural Heritage & Endangered Species Program, The Nature Conservancy, The Trustees of Reservations, and the Woods Hole Research Center. Contributors range from Kennebunk, Maine to Long Island, New York.